Woohoo – voting is closed and we have a winning stitch! Thank you to everyone who clicked. 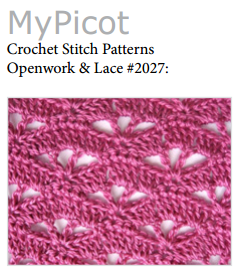 With 11 votes, the winning stitch was Openwork & Lace 2027. Now it’s our turn. Over the next 4 weeks, we (Samantha, Crystal and Tammy) will do our best to see what we can design with it. This entry was posted in Crochet on July 1, 2014 by Thomasina Cummings.